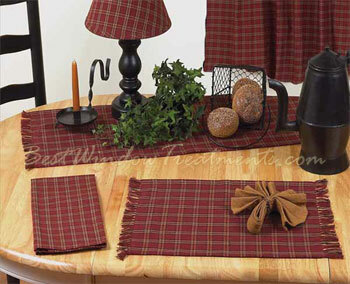 Sienna Plaid Table Runner features a small scale plaid. Handcrafted with care, this table runner is made with high quality thick 100% cotton fabric. Available in Size: 14" x 36"
Care: Machine Washable in cold water/gentle cycle. Line Dry. Complete accessories available - lampshade, curtain panels, valances, fishtail swags, tier curtains and placemats. See related products below. If you need this itemby a certain date, please email customerservice@bestwindowtreatments.comfor the latest inventory information. We will respond within 24 hours. View our Best Window Treatments customer information.